Did you know that Bio-Dry provides service as well? We clean over 1,000 locations annually across the United States. While our main focus is on drive thru maintenance, we also service parking lots, parking decks, entrances and even industrial dock aprons. If you are tired of those nasty oil stains, give Bio-Dry a call today or email us at business@bio-dry.com to find out what we can do for you. Our cleaning services are designed to fit your needs and your budget. Did you know that 95% of customers say the exterior appearance is important in their selection of a place to shop? Did you know that 52% of customers have avoided a business completely because it looked dirty from the outside? We clean the area, removing excess buildup of oil, grease and other gunk. We use our patented Bio-Dry cleaners to break down and absorb what is just below the surface, removing when absorbed. Finally, we finish off with a fresh coating of our cleaners to continue cleaning below the surface while also coating and protecting. Completely waterless, so drought and freezing is not a problem. And with no harsh chemicals or high pressure, you don’t have to worry about blasted out expansion joints, ripped of concrete, or removal of the cream (top smooth layer) of your concrete. All of that stays in tact. And in most cases our trained technicians perform the work when your business is closed. Where can Bio-Dry Solutions help? 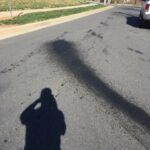 Are you tired of looking at old oil stains on your asphalt driveway? Is your parking lot or drive-thru beginning to look less than appealing? At Bio-Dry, we are your oil stain experts, and our number one goal is to provide services that save you money, keep your business compliant, and improve your image. Our cleaning services are designed to fit your needs and your budget when you need help keeping your business looking its best. Our services are excellent for a wide range of industries, including banking, fast food and property management. Bio-Dry products provide a lasting and cost-effective solution for automotive fluid problems on concrete and asphalt, including oil stain management and removal for drive-thrus and parking spaces. Our patented green cleaning products are easy to apply, environmentally friendly, and are packaged in easy-to-use containers. If you are looking for solutions to keep your business looking its best, contact us at Bio-Dry Services for more information about our products and services. You will find that Bio-Dry makes your business look better. Our products last longer than pressure washing, and they attack and protect against stains. Don’t settle for an inconvenient cleaning schedule – contact us at Bio-Dry Solutions to learn more about how we can assist you.